The Aggression/Control Test for Hospital/Security Teams is a comprehensive evaluation of the Team’s control and courage under situations simulating on-duty encounters. This test was created for those Hospital/Security Teams that DO NOT wish to have gunfire administered during the test. It is the sole responsibility of the Handler to advise the Master Trainer of this request. If the Team is requesting gunfire the test shall follow the guidelines as the same for Law Enforcement. The Master Trainer/Trainer will check and approve all equipment prior to the test, as well to assess the capability of the Team and Decoy. At any time the Master Trainer can terminate the test for equipment deficiency, decoy inexperience or any other cause deemed to be significant safety concerns to the Handlers, Bystanders or K9’s. A bite suit, sleeve or hidden sleeve can be used by the decoy per the Master Trainer’s instructions. K9 will be placed in a down or sit/stay stance. The decoy will proceed quickly away from the Team with NO apprehension from the K9 at approximately the distance of 50′-150′. The Handler will then “send” the K9 and terminate, call out, the send at a distance of approximately one half of the total distance. The “send” can be terminated by a sit, down, or a recall. There can be no contact between the decoy and the K9. The Handler will bring the K9 to the heel position by either recalling or proceed to the downed K9 and placing the K9 in the heel position. The K9 will be commanded by the Handler to make an Apprehension, bite, on the decoy at a distance approved by the Master Trainer. The K9 must make the apprehension in order to pass. 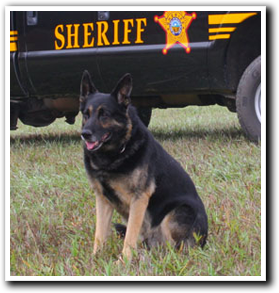 The Handler will either call out the K9 and have the K9 return to the heel position or down the K9 at a location of approximately 15”-75′ from the decoy. The Handler will approach the decoy and conduct a “pat down search with NO apprehension made by the K9. Master Trainers will have the authority to NOT GRANT a “pass” rating based on an excessively weak or poor bite. Failure to “call out” the K9 in a timely manner, or any unauthorized bite by the K9 will result in a failure. Any urinating/defecating in training area and/or immediate grounds during the test is a failure! The Hospital/SecurityAggression Control test will remain in effect as long as a good standing member with NAPCH and the Team remains in intact.